Here at Melrose, we are inspired by and love working with other people who are as passionate about healthy living as we are. That's why we've parternered with some of the most inspirational and wonderful minds below to help bring the Melrose ethos to life through recipes, informative articles, videos and more! Meet them below! “I want to work with brands and organizations that are 100% aligned with what I believe in, and at Melrose they’re a great team of passionate people, producing quality products and I love what they stand for." Rachael Finch is the poster girl for living a wholesome, holistic life. Rachael balances her duties as a mum with her professional career as a TV presenter, business owner, author, and leading health and wellness advocate. As a host and presenter for the Seven Network since 2010, Rachael has presented across a wide range of shows from lifestyle to fashion and sports programming including the Spring Racing Carnival, Australian Open Tennis Championships, Olympic & Commonwealth Games and the AFL Brownlow Medal Red Carpet. In 2015, Rachael was also announced as an ambassador for Australia's largest department store, MYER, a role that sees her working across a variety of their events and marketing activities. An advocate for leading a healthy and balanced lifestyle, Rachael is a popular brand ambassador in the fashion, health and fitness spaces. Rachael has taken her passion for health and nutrition to the next level, expanding her skills to become a Certified Health Coach and Personal Trainer. She has also combined her passion for food and health in her best-selling book 'Health, Happy and Strong, - an inspiring, affirming and beautiful guide to looking and feeling great, inside and out including over 85+ delicious clean wholefood recipes. Rachael has also extended her business & fitness journey by establishing her BODY by Finch online wellness program, which provides meal plans, BODY workouts, meditation and mindfulness tools direct to your mobile or tablet on the go. Rachael also launched the B.O.D by Rachael Finch activewear range designed for women that is comfortable, supportive and neutral to empower women to feel happy, healthy and strong. Rachael is motivated by a genuine desire to live every day to its fullest, and to share her experiences of feeling great and happy with her significant online following. 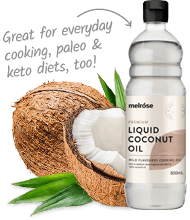 “Being part of the Melrose Health team is a dream come true, Melrose is an inspiring business dedicated to creating the best possible range of whole food products for people who want to lead a healthier life. I know first hand the quality of these products and love cooking with ingredients I know have no added nasties, are mainly organic, taste amazing and make you feel great from the inside out." Dani Venn is a Melbourne based whole foods cook, most widely known for her time as a finalist on MasterChef Australia in 2012, All Star in 2012 and host of Weekend Feast on Channel. Dani shares her passion for real food, health and everyday wellness through her blog, The Wholehearted Cook. and living by her mantra ‘nourish, nurture, glow’ by running wellness retreats in beautiful locations around the world. Dani is also the creative director of Eat It Up Creative, a food and communications consultancy for food related business. Steph’s extensive nutritional experience spans from elite athletes, to schools, and corporations, where she has worked with the likes of Grill’d to develop new menu items, and Savills where she educated corporates about real food for productivity and performance in the workplace. Along with self-publishing her first book, The Real Food Athlete, and running The Natural Nutritionist, Steph is also the resident Nutritionist for Melrose Health and is launching a 12-week online program, LCHF Endurance, in 2018.